Swallowing difficulties after Botox injections.What to do and how to avoid them. Some patients experience swallowing difficulties after Botox injections, due to the spread of the Botulinum toxin to adjacent muscles. Dysphagia (swallowing difficulty, choking on food and/or fluid) is the most serious local side effect, following Botox injections. It can occur in the most expert pair of hands as the response to Botulinum toxin varies among patients. A given dose of Botulinum toxin will be not enough for some patients, but for others it will too much, responsible for spreading to muscles next to the injection site. Side effects occur most often 10 days after the injection, but may occur earlier, 2 or 3 days after injection. All the side effects are transient, lasting on average 4 to 6 weeks after the injection. You can be reassured that all the side effects disappear completely with time. a- Dysphagia can follow injections into the front neck muscles, the sterno-cleido-mastoid (SCM) muscles. When these big muscles in the front of the neck are injected, some of the Botox can leak into the surrounding muscles, called the strap muscles. These strap muscles act on the hyoid bone, which is attached to the bottom of the tongue. Normally the strap muscles keep the hyoid still and allow the tongue to push the food back into the throat to trigger the swallow. 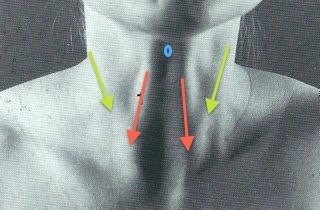 If the muscles are weak, it does not happen properly and patients can get a feeling of choking, worse with solid food. These swallowing difficulties after SCM injections are more frequent if both sides (right and left SCM ) are injected, if large doses are injected, if the neck is very slim. b- The injections of the Longus colli muscles for severe antecollis (dystonic flexion of the neck). These muscles are found deep in the neck and are very close to the muscles of the gullet, responsible for pushing the food down towards the stomach. If the injection is put in too high up, the ability to push the food down can be reduced; this is usually a problem with swallowing solids. We usually avoid this happening by testing that we are below the swallow muscles during the injection by performing the injection under EMG (recording of the muscle activity), to check when the patient is drinking, just before the injection, that the needle is out of the pharyngeal constrictors. 2- Dysphagia following tongue muscle injection for tongue dystonia or following mouth floor muscles (supra-hyoid muscles) injection for opening jaw spasms is frequent. The reason some people struggle with swallowing after this injection is basically the same as after SCM injections and the weakening of the strap muscles. The mouth floor muscles and the bottom of the tongue muscles are attached on the hyoid bone. The power of the back of the tongue is reduced and the ability to push the food backwards, towards the top of the gullet, and trigger the swallow reflex is impaired. 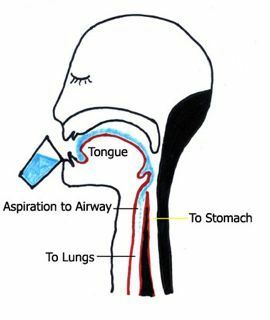 3-Dysphagia , following laryngeal (voice box) injections, is mainly when drinking fluid and are usually mild. Apart from making a sound for speaking, the main function of the vocal cords is actually to protect the lungs from things falling into them. When Botox is injected into the vocal cords from the front, the closing action is weakened. In most patients this does not cause a problem but some people find that they have an increased tendency to cough when drinking fluids. Very rarely it can also affect eating solids. Drawing from website on swallowing difficulties after stroke, which explains how aspiration pneumonia can happen. What to do if you have a problem with swallowing? As with all Botox side effects, the problem will get better with time. The average length of side effects for most people is a couple of weeks but some will have less and some more. There are many ways to help yourself during this time. 1-Take small mouthfuls and chew carefully before trying to swallow. 2- If food feels like it is slow to go down, keep a glass of water nearby to help wash down the food. 3-Consider eating softer consistency food (thick soup, yoghurt, mashed vegetables) for a short while, avoid crusts, large pieces of meat and anything very hard. Eating in front of somebody and not alone is recommended. 4-If swallowing fluid is making you cough, make sure you are sitting up when drinking. Sip slowly through a straw as this allows you to keep your chin tucked down and this makes it more difficult for the liquid to spill into the voice box. Sucking ice/ice lollies can get you quite a lot of fluid but as it is delivered in very small amounts does not cause any coughing. What to do to avoid the side effects at the next session of injections? 1-Swallowing difficulties, which can exist before the injections, have to be reported to your doctor, before the injection. – It has been shown that patients with already swallowing difficulties before injection, due to their dystonia, are more at risk of severe dysphagia with Botulinum toxin treatment. – Swallowing difficulties are frequent before any treatment in cervical dystonia, (from 36% clinically to 72% when investigated), in spasmodic dysphonia and in oro-mandibular dystonia. – The Speech and Language Therapist may x-ray the mouth and throat area to see what the precise swallowing difficulties are. This x-ray is called a videofluoroscopy. This x-ray will help to determine what types of food and drink are safe to swallow and what dysphagia therapy might be appropriate. – Studies showed that Cervical dystonia patient with dysphagia can have difficulty to drink only 1-10ml in one attempt, in contrast with non-dyphagic patients with cervical dystonia who can drink 20 ml in one attempt. a. If already dysphagia, the doses into the front muscles should be limited. b. At a session of injection, following severe dysphagia after the initial injections, the injection sites and dosages should be adjusted to avoid the reoccurrence of any side effect. c. It may also require delaying the injection more than usual, 14 weeks instead of 12 weeks for instance, to avoid any cumulative effect. It’s very important that the patient documents precisely the nature of the side effect, (for instance, choking on fluid or on food, need to drink to wash down the food after eating), in particular if the patient is not seeing his doctor in between 2 sessions. A dairy of the events will be very helpful for the doctor when adjusting the next dose. Dysphagia is frequent before injections in patients with dystonia, but can also be a local side effect of the Botox injections. Being cautious when drinking and eating, and talking to your doctor are the best advices. It can be a scary time, but it will all go back to normal after 3 to 6 weeks time . Also it can be avoided the next time, so it should not discourage you for having further injection. I wanted to thank my collaborator, Ms Lucy Hicklin, ENT surgeon, a specialist of Botox injection into the vocal cords for spasmodic dysphonia and into the Longus colli for antecoliis for her contribution to this post. Lid watching, a lost art!